This page shows how it is possible to connect Hard Disk Sentinel Professional and Nagios: how Hard Disk Sentinel Professional can provide hard disk status information - and how Nagios can accept and manage the collected status information. check_nrpe has to be checked, others are recommended (for other checks). Password is not necessary for nrpe checks. Restart the NSClient++ service after the changes. You can also replace $ARGx$ by a value. For example I have decided to replace $ARG1$ by the XML file Path, so I do not have to add it as an argument for each Nagios-service. In this case do not forget to replace "$ARG2$" by "$ARG1$" (and so forth). 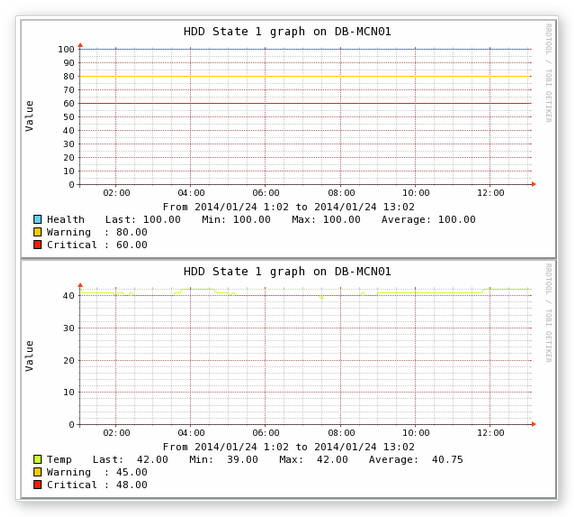 Note by Editor: Nagios doesn't like spaces within the parameters! Make sure to use the short version of path/filename in case it contain spaces, like: c:/PROGRA~1/HARDDI~1/HDSENT~1.XML Alternatively, you may specify a folder in the beginning (step 1) where there is no space, for example: C:\HardDiskSentinel , C:\HDS or similar. Note: Do not forget to define the host! Thanks for Guilherme Orcutt for the script and Jakob Hirschl for the tutorial and information !